I mentioned the other day that I had passed a pretty important anniversary: June 18, 2010, was the last time that I had takeout delivered to my apartment. I've gone out to eat a few times since then, but there's a big difference for me between going out and ordering in, even if it involves the same restaurant. I love to cook, so if I am eating out, I'm not alone - it's a social experience. On the other hand, ordering takeout used to mean getting enough food to feed a small family, then sitting alone on the floor of my living room, shoveling it in as fast as I could and washing it down with soda straight from the bottle. When I first started to eat better, it was like a detox. My body craved fast food so badly, I would shake. I cried myself to sleep a few times, I wanted it so bad. I knew if I fought it, the symptoms would clear up and I'd be better for it. But in the moment, it's hard to focus on long-term results. It wasn't that I wanted a cheeseburger - it felt as if I needed it, and not getting it would kill me. As my body adjusted to cleaner, unprocessed food, I knew that I would need to arm myself with a fast food replacement if I was going to be successful with my weight loss. I've written before about my issues with cheese: it's pretty much my favorite food, so every time I've tried to diet, I cut it out completely ... then craved it so bad that I lost control and binged on it. This time around, I buy a single-serve string cheese or have one or two pieces sliced for me at the deli, and it's enough. I allow myself a reasonable amount of what I want, and it prevents me from feeling deprived. And I did the same thing with my fast food cravings. I learned how to make veggie stir-frys. I made cauliflower crust pizza. And I tried all sorts of different turkey/bean burger recipes - that way, I can emulate the fast food experience without all the extra calories, fat, and sodium. And my first thought was, I could lighten that up. I went to the Burger King website and got the nutrition facts. Ho. Ly. Cow. (Or chicken, as it were.) 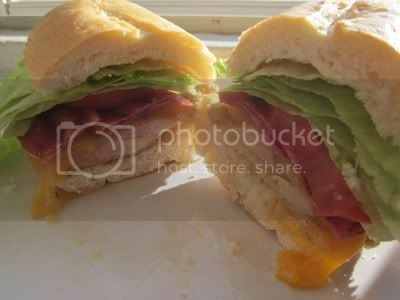 The sandwich - no fries, no drink, just the sandwich - has 900 calories! It made me think about my fast food binges and how I'd usually get two or three sandwiches (with the justification of "but I'm not ordering fries"). And how I probably saw the nutrition information on a poster or brochure in the restaurant, but still didn't think twice about it. Having calorie counts and other nutrition information available is great, but they're meaningless until you actually understand what it means. Eating three 900 calorie sandwiches isn't a problem when the number 2700 is irrelevant to you. This is one reason why I feel this attempt at getting healthy is The One for me - I've been enlightened. I know about calories and how many I ideally need to eat/burn every day to lose, maintain, or gain weight. There may be a day when I eat a fast food sandwich - but never again will I have a portion like I used to, because I know what that means for my body in both the short- and long-term. And honestly, compared to what you get at a fast-food place, I like my versions better. They're more filling (amazing, because it's fewer calories) and much more cost effective - the ingredients to make four sandwiches would cost only slightly more than one BK value meal. 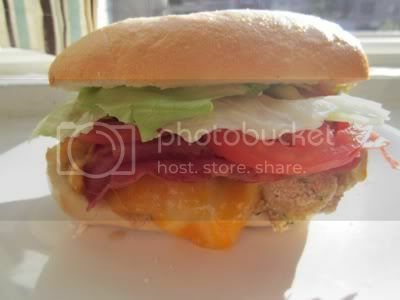 So, I undertook the challenge of remaking this sandwich. I scoured the internet and looked through my pantry to come up with nutrition information for my version. And wouldn't you know, I shaved off over 500 calories! Not to mention cutting fat, sodium, and sugar by more than half each! Needless to say, the results of my research efforts were tremendously worth it. Preheat oven to 375º F. Combine breadcrumbs and ranch dressing mix in a medium-size bowl. Dip cutlets into egg white, then into crumb mixture to coat. Place on a baking sheet and bake for 16-20 minutes, turning over after 8-10 minutes. When 3-4 minutes remain, place sliced cheese on top of cutlets to melt. Allow to cool for 1-2 minutes, then serve on sandwich thins topped with 2 pieces of turkey bacon, plus lettuce, tomato, and onion to taste. Delicious. A definite keeper. The ranch flavor was definitely there but way healthier than if I had smeared ranch dressing all over it. It's my own recipe but I made a substitution - I developed the recipe for 4 but I'm just one, so instead of the sandwich thins, I bought one roll at the bake shop and adjusted my calories accordingly. (I can't keep quantities of bread in the house just yet.) And you could probably cut calories, fat, and cholesterol further if you used reduced fat or fat-free cheese. I've never been a bacon fan (even before, I thought it was too greasy! ), but I liked the turkey bacon. It had a good flavor and I cooked it on the George Foreman grill to get it perfectly wavy and bacon-like. Thanks for hanging in there this week with all my recipes - I only lost a few readers, so hopefully it wasn't too bad. I promise to resume with actual content tomorrow! What about you? Do you ever recreate restaurant meals at home? What are some of your favorite healthier ingredient substitutions? I'm SO excited to make this tonight. I'll let you know how it goes! As for me, a HUGE trigger for me is pizza. I don't know if I'll ever be able to order a pizza in again. However, I've learned how to get that pizza fix while still at home, without the danger of having an extra large with cheese and bacon. Nowadays, I take a whole wheat pita, 1/4 cup of Hunt's Traditional Spaghetti Sauce, some fat free shredded cheddar and a few pieces of Turkey pepperoni. I was skeptical about it at first, but it actually tastes full-on like a pizza, and all for about 200 calories. That's something I can work with. OMG - that looks AMAZING. What a GREAT idea! Looks better than the original. I bet my hubby will LOVE it! Totally stealing the recipe! I'm personally on a challenge not to eat fast food at all between July 1st and December 31st, and possibly to continue on after that. The first half of the year, I mostly stopped eating it anyway, but I would still have it every once in awhile when I needed something fast. Now I'm training myself to find other options for fast stuff. Pizza, though...that's the hard one for me. I love it so much, but it's super bad for me. Girl you are so talented.....that looks amazing.....you should send Jillian the link on twitter.....you never know!!! 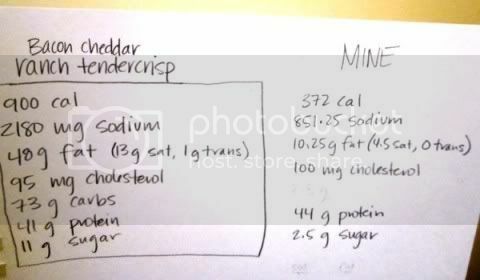 I am so glad you made the tendercrisp because I was very curious about what it could be when reading the twitter post. I never considered adding ranch dressing to the breadcrumbs. What a splendid idea! I love Arnold thins. I eat one every day! I do not recreate recipes anyone would know. Every once in a while I eat something out and pick it apart or ask what's in it and then rework it at home. I think it is a good exercise. If you love fast food I think it is imperative to see if you can redo this at home. ANYTHING to help us get and stay healthy and be the best we can be. I like your replacement version, it looks great and so much more appetising. On my holiday to the USA a few years back I thought it was pretty good that fast food restaurants showed the calories for each product (gotta be honest, at first I thought it was the price, I was so confused LOL). I think it's something that the UK needs to bring in because I dont think people actually realise just how bad fast food is, even the salads in the restaurants are calorific! When I saw the calorie numbers in the USA, it actually scared the hell out of me. I don't think I have eaten a McDonalds since my burger in New York City. That looks effing amazing! I am saving this one as well. I can remember that before I got serious with my weight loss I would go to McDonalds and get the 20 piece chicken nuggets with sweet & sour sauce, large fries and a large diet coke. I can't even imagine how many calories that is. I have had chicken nuggets since I've started but I only order the 4 piece order with small fries and small coke. I've only gotten this 4 times in the past 10 months but I amazed how full I feel after I eat it. How the hell did I manage to eat 5x that is beyond me. I've never recreated restaurant meals at home but I do like checking food blogs which show you how to minimize calories by substituting different food items. Congratulations on making it an entire year without ordering in! That's a huge accomplishment. As far as healthy substitutes for restaurant foods - we don't go out much, but I do love taking an unhealthy "Paula Deen" recipe and making it healthy and yummy! WOW this is such a fantastic post- so inspiring and relative to appliny your tricks into real life. That is sooo awesome!!! wonderful, i'd have it as a salad without any bread and a splash of cesar dressing! you certainly are a clever resourceful girl!.............pretty and smart now that's a GREAT combo! Bless you for sharing your improved version! I'm soooooooo making these next week!! Yay!!! So if you put this into Weight Watchers it comes up as 10 points which is really pretty good for a dinner sandwich! I think we will be trying this! Thank you for the recipes! Why oh why did I have to read this at 1:15 a.m. when my belly is growling like crazy?! I can't wait to make this next week as it's my favorite BK menu item! That sandwich looks amazing! 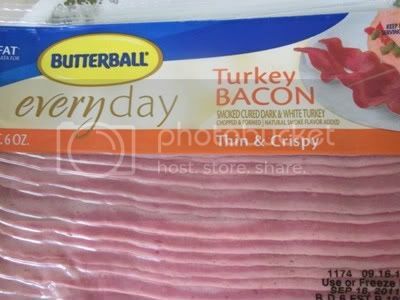 And that is our favorite brand of turkey bacon...I think I've tried them all and the butterball has the best flavor and texture. That IS bacon in our house and the kids don't know the difference. Love it crumbled up on salads. I think your recipe/cooking posts are great. We still get glimpses and insights into YOU, and that's what your readers really want. It's all part of the journey. Post what you want!! !